An ad sign for Note 7 is seen at a mobile phone store in Ho Chi Minh City on October 11, 2016. The decision of Samsung to stop producing its flagship Galaxy Note 7 worldwide may adversely affect the export revenue of Vietnam, home to two major mobile production complexes of the South Korean smartphone maker, industry insiders say. “Consumers with either an original Galaxy Note 7 or replacement Galaxy Note 7 device should power down and stop using the device and take advantage of the remedies available,” it said. Also on Tuesday, the Vietnamese unit of Samsung released a statement saying buyers or pre-order customers of the phablet are eligible for a 100 percent refund when returning the device. In line with the Samsung global policy, Samsung Vina also halted the exchange program, which was previously expected to run until the end of this year. Vietnamese Samsung users will also receive a gift voucher worth VND1.5 million (US$67) when returning their Note 7 at a qualified Samsung outlet. 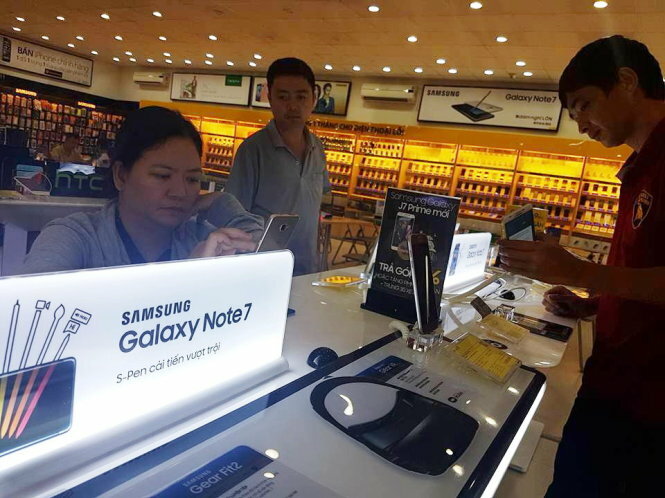 In Vietnam, a Note 7 was sold at VND18.99 million ($848). Samsung started selling the Note 7 at home on August 19, but soon had to launch a global recall the following month, as some of the devices reportedly caught fire while being charged. The recall affected some 2.5 million handsets prior to the company’s decision to halt the sales, exchanges and production of the ill-fated Note 7. The permanent halt of production “includes a Samsung plant in Vietnam that is responsible for global shipments [of the Galaxy Note 7]," Yonhap news agency quoted an official at a supplier for Samsung as saying on Monday. Samsung Electronics has invested $11.2 billion in Vietnam, including a $2.5 billion mobile production complex in Bac Ninh, and a $5 billion such facility in Thai Nguyen, both northern provinces. The two plants account for some 30 percent of Samsung’s global smartphone sales. A source close to Tuoi Tre (Youth) newspaper said one of the two complexes was producing the Galaxy Note 7, similar to the Yonhap report. A Vietnamese customs expert therefore asserted that the production halt of the Note 7 will affect Vietnam’s export turnover of the mobile phone and parts in particular, and the country’s export revenue in general. Mobile phone and parts account for some 20 percent of Vietnam’s total export turnover, and the Samsung facilities hold nearly 99 percent of the shares, according to Professor Nguyen Mai, chairman of the Association of Foreign Investors. In the Jan-Sep period, Vietnam raked in $25 billion from selling mobile phones and spare parts, up 8.6 percent from the same period last year, with the U.S., the EU and the UAE being the main importing markets. This year Samsung Vietnam targets a total export turnover of $34.5 billion. However, Mai rejected a request to comment on whether the plan will be affected by the Note 7 scandal.